Oh I really did enjoy making this card! The yellow / grey colour combination is one of my favourites. 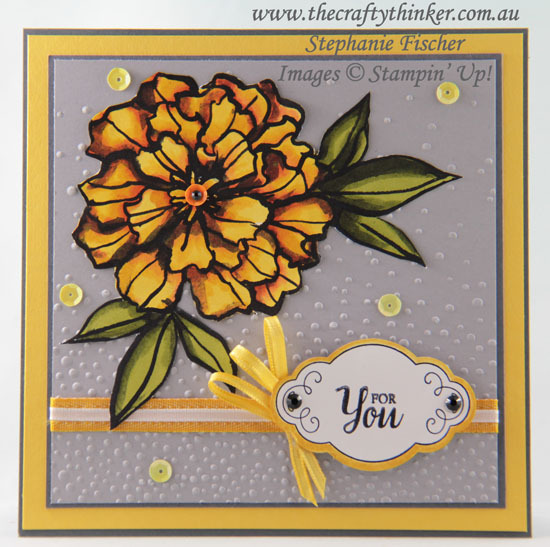 The 6" square Basic Gray base card is layered with Daffodil Delight, Basic Gray and Smoky Slate. The Smoky Slate layer was run through the Big Shot in the Softly Falling embossing folder. I fussy cut the gorgeous flower from a piece of Petal Passion Designer Series Paper and coloured it with Stampin' Blends alcohol markers. I placed an orange coloured Tutti Frutti Self Adhesive sequin in the centre of the flower and added a small Black Rhinestone. The greeting is from the So Many Shells stamp set and I made the label with the Label Me Pretty Bundle (stamp set and punch), adding some Daffodil Delight ink to the edge of the label and a couple of Black Rhinestones. I wrapped lengths of Crushed Curry and Whisper White ribbon around the card and coloured another piece of the Whisper White Ribbon with a Stampin' Blend marker (Daffodil Delight Light). I cut that ribbon into three pieces, formed loops and stuck them into position with glue dots. The final step was a scattering of yellow Tutti Frutti sequins.